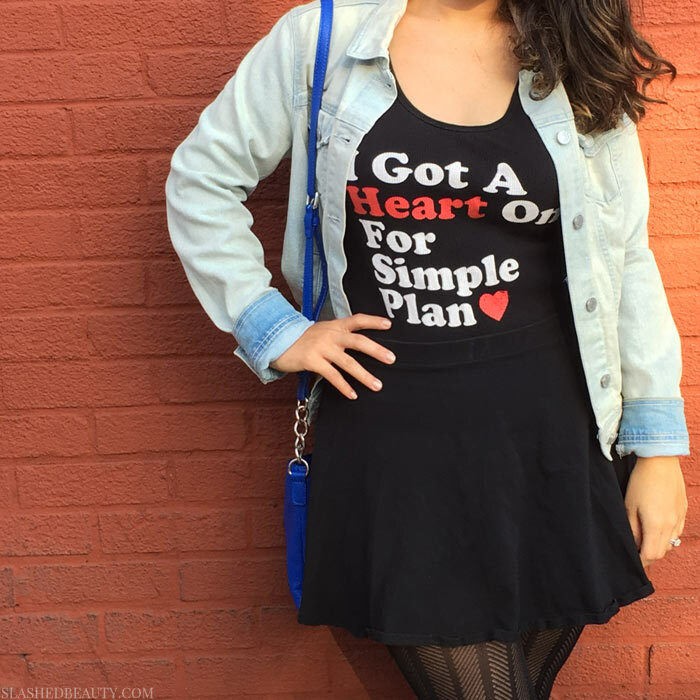 Back in June, I snagged tickets to the sold-out Simple Plan show in Los Angeles. They’re my all-time favorite band from my childhood, and last week was my sixth time seeing them live. Of course I had to show my love with one of their band t-shirts I picked up at their last show– one of the best days of my life (after getting engaged, of course), since I got to meet them in person. I’m always looking for an excuse to get dolled up, and I wanted more of a night-out look to wear to the show. 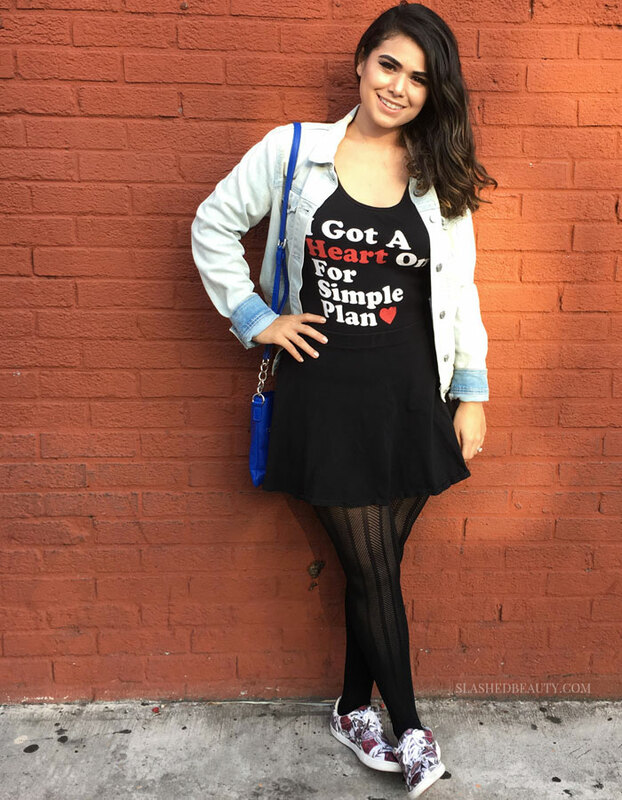 Despite the casualness, it’s actually pretty easy to dress up a band t-shirt to create a trendy outfit. First up, I had an advantage that my shirt was a tank, because it had a low scoop neckline. If you’re working with a unisex band t-shirt, doing a quick DIY by cutting the collar a little lower will transform the mood. Plus, it will give the shirt more of a worn, lived-in look that’s fitting for the concert scene. I layered the shirt under a jacket to add more shape to the outfit. The denim also added a light color to an otherwise dark ensemble. To add a bit of femininity, I wore a black skater skirt that almost made the whole outfit look like a dress! I wore it high-waisted which accentuated my waist, since you often lose your silhouette under t-shirts. Mine was plain cotton, but choosing a leather skirt or a textured fabric would also enhance the outfit. Since I wore it high on my waist, the skirt was a teensy bit short. To help add more coverage, I paired the skirt with these patterned tights that still let a little skin show through, which helped break up all of the black. Small cross-body bags are super convenient for concerts, and are another opportunity to add a pop of color. Since I had a lot of red and black already worked in, I decide to match my bag to my jacket with a splash of blue with gold accents. It is imperative– especially when attending a Simple Plan show– that your shoes allow for dancing and jumping! 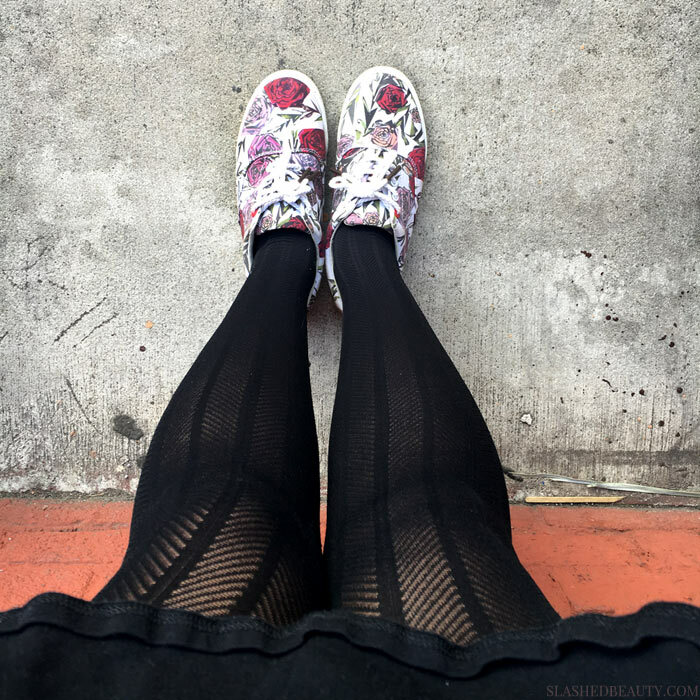 I knew right away that I’d be good for the night in my Bucketfeet lace-up sneakers, which are not only stylish with their geometric rose pattern but also extremely comfortable with cushion bubbles on the inside to pad my feet when moving around. I can honestly say I was jumping all night without a care in the world! The concert was freaking amazing, and actually my second time seeing them at this particular venue… the last time being 10 years ago! I had an awesome night and this outfit let me let loose while looking cute. How do you like to dress up a band t-shirt? Omg it was soooo fun!